ANNOUNCEMENT: Rapid City And Bismarck Shows WILL NOT BE CANCELLED! The Independent Powerhouse Tour show tonight in Rapid City, South Dakota and the show tomorrow night in Bismarck, North Dakota WILL GO ON despite the ridiculous amounts of snow y’all have been getting. 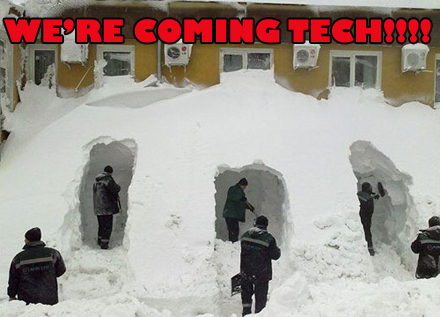 Tech N9ne and the rest of the crew have vowed to give y’all a killer show, rain, hail, sleet, or snow! Tonight’s show at The Rushmore Plaza Civic Center will still begin at 7:00 PM, with the meet and greet still going down at 3:00 PM! The same can be said for tomorrow night’s show at the Bismarck Civic Center Exhibit Hall! While VIP packages have already sold out for tonight’s show in Rapid City, tickets are still available and both VIP Packages and tickets are available for the show tomorrow night in Bismarck! So strap your snow shoes on, grab your shovels, and make sure to leave early so you can drive nice and slow to the venue! We want y’all there in one piece!! !